Found 41 file extension associations related to DAZ Studio and 16 file formats developed specifically for use with DAZ Studio. DAZ Studio is a feature rich 3D figure posing and animation tool that enables users of any skill level to easily create stunning digital imagery. Whether youre a 3D newbie or an avid 3D artist, you'll find DAZ Studio is the perfect tool for designing unique digital art and animation with virtual people, animals, props, vehicles, backgrounds and more. 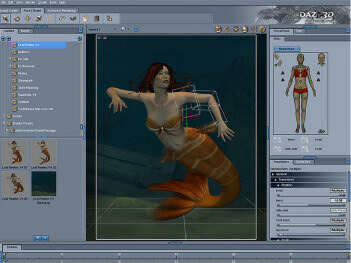 Experience total creative freedom with DAZ Studio and express yourself in 3D like never before. If you need more information please contact the developers of DAZ Studio (DAZ 3D Inc.), or check out their product website.